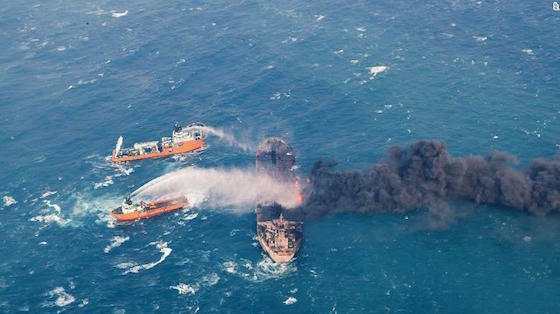 Firefighting boats work to put on a blaze on the oil tanker Sanchi in the East China Sea off the eastern coast of China in this Jan. 10 photo provided by China’s Ministry of Transport. An oil spill from an Iranian oil tanker that sank in the East China Sea is now the size of Paris. The slick now covers 39 square miles after almost doubling in size from the start of the week, according to figures released Wednesday by the Chinese State Oceanic Administration. Chinese authorities said there were four separate slicks that had formed after the Panama-registered Sanchi tanker sank last Sunday. The largest oil slick is 19 square miles, it added. The administration did not respond Thursday to a request for additional information. The tanker burned in the East China Sea for a week following a collision with another vessel. All crew members, 30 from Iran and two from Bangladesh, are presumed dead. The Sanchi was carrying 136,000 tons — around one million barrels — of oil from Iran to South Korea when it collided with the Hong Kong-registered CF Crystal freighter in the East China Sea January 7. The tanker was carrying condensate, an ultra-refined, highly volatile form of ultra light crude oil used to make products such as jet fuel. Environmentalists and officials are worried the oil on board and fuel used to power the massive vessel could harm aquatic life for decades. “The critical thing is to understand that when we put hydrocarbons into the oceans through events like this, it’s going to affect a wide range of animals,” said Jessica Meeuwig, a professor of biological sciences at the University of Western Australia. The collision site was within the Zhoushan shipping ground, considered to be one of the richest fishing grounds in China, Ma Jun, one of China’s leading environmentalists said. Condensate, which is made up of a mixture of hydrocarbons, is lighter than the thick black crude oil associated with some of the world’s worst oil spills, such as the Exxon Valdez disaster. Eleven million gallons of crude oil poured into the ocean when the tanker ran aground off Alaska in 1989. Condensate oil’s high volatility means it evaporates more easily than heavier crudes. Some of the oil on board the Sanchi — though it’s unclear how much — was likely consumed in the fiery blaze after the crash, environmentalists said. Three bodies were recovered over the week and just hours before the Sanchi sank to the ocean floor. Iran’s Special Task Force spokesman Mohammad Rastad said testimony from rescued crew on the CF-Crystal, as well as from rescue workers, suggested the Sanchi’s crew likely died early on from a massive blast and the ensuing release of toxic gas, state media reported.